You are here: Home / Brow Lift / It’s Not Heavy. Lift that Brow. It’s Not Heavy. Lift that Brow. As we age, our brows sag and droop. Maybe not to the degree of Deputy Dog from the cartoons, but they droop. The forehead and eyebrow tissues descend and hood along the upper ridge of the eye. This results in a perpetually mad or tired look. Who wants that? Everyone will think you’re a curmudgeon! But a brow lift with Dr. Jones can bring back your younger days. A brow lift will benefit patients with sagging or low eyebrows and those with horizontal creases on the forehead. And the 11’s? Yep, a brow lift turns them into the zeroes! Want to see if you could use a brow lift? Take your palms of your hands and place them above and just outside of your eyes. Now pull up and a little outward. That’s basically what a brow lift can do. The procedure can take years off your face. A brow lift with Dr. Jones is done on an outpatient basis. The procedure usually takes from two to three hours. There are various methods available depending on your needs. Coronal brow lift — This is a traditional brow lift. An incision is made across the scalp, running from above the ear up and around the forehead, ending above the other ear. The incision is made in the hairline to hide it. The skin is pulled away and underlying muscles may be repositioned and tightened. Then, excess skin is trimmed. 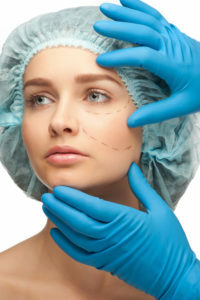 Endoscopic brow lift — If the patient doesn’t need as much trimming, an endoscopic brow lift could suffice. A series of very small incisions are made and an endoscope is inserted into one. This provides Dr. Jones with a view of the area, without the need for the full incision of a coronal lift. He can use the endoscope to reposition muscles. Transpalpebral brow lift — This is a limited procedure, making an incision on the upper eyelid to correct frown lines between the eyebrows or at the top of the nose. Direct and mid-forehead lift — This technique creates more incisions, so is used only as a last resort. Interested in getting rid of that perpetually mad look? Call Dr. Jones at 405.418.5400 and let’s talk about a brow lift. Leave the Spider Veins to the Eight-Legged Types Where Do the Most Plastic Surgeons Practice?